Dow 13,000: What got it there? 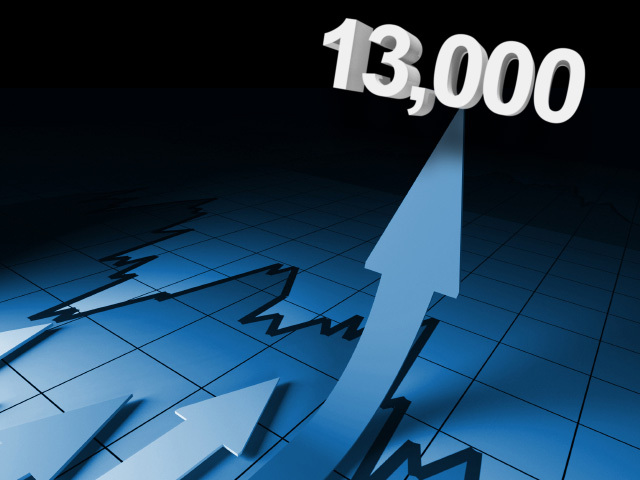 For the first time since May, 2008, the Dow Jones Industrial Average traded above the psychological milestone of 13,000. Yes, 13,000 is just a number, but every time we reach a milestone, it helps investors shed a little bit more of their post-financial crisis stress disorder. Given that the Dow was touched a 52-week low of 10,404 last October, the recent move is substantial. US stocks have gained over 22 percent since those precarious lows and the blue chip index is only 8.5 percent away from the all-time closing high of 14,164.53, reached on October 9, 2007. As MoneyWatch blogger Allan Roth reports, the market is a hair away from crossing a more significant, but less noticed, milestone: If you look at the entire market, rather than just the 30 stocks in the Dow, U.S. stocks have recovered within one percent of their all-time high, reached on Oct. 9, 2007. The inevitable question is why have stocks have done so well? The answer is three-fold: (1) Greece/Europe didn't collapse, (2) the economic data in the U.S. has improved and (3) central banks across the world have turned on the spigots to make money abundant. 1. Back in October, there was a real fear that the European Union was falling apart at the seams. The Lehman Brothers analogies with Greece were flying and talks about skyrocketing borrowing costs for Spain and Italy were real. Progress started after the European Central Bank created a mechanism in December called the "Long Term Refinancing Operation," (LTRO) to lend money to European Banks at one percent. The banks in turn took that money and lent it to weak European economies, which prevented a run on those countries' sovereign debt. 2. The U.S. economy has seen improvement across the board since October. The best progress has been in jobs, where there has been steady progress. In January, there 243,000 new jobs and the unemployment rate dropped to 8.3 percent, the lowest it's been since February 2009. There has also been improvement in manufacturing and even in the beleaguered housing market there are some tiny glimmers of activity. 3. Easy money: Not only has the ECB opened the spigots, but the Federal Reserve has said it would keep its benchmark rate at 0-0-.25 percent until 2014 and the People's Bank of China has now taken its foot off the break and eased reserve requirements. With global central banks following a highly accommodative monetary policy, investors are more inclined to move into risk assets, like stocks. Before we get too carried away, the problems in Greece are not over. I would wager a tidy sum that we'll be hearing about a third Greek bailout in the not-too-distant future. Meanwhile, oil prices are on the rise, which might keep a lid on economic progress and corporate profits, as consumers shell out more at the pumps and less at their favorite retailers. Still, I know you want to enjoy the moment, so Happy 13,000!